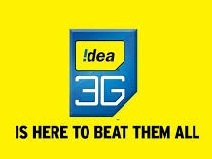 Idea cellular is offering free 50MB 2G/3G Data to its user.This offer is valid for all india idea users.All users will get 50 MB 2G/3G Data according to network availability.Follow Steps To Grab Free Internet. 1.First Visit Here with your idea connection only. 2.You will get a confimation sms. 3.Confirm this,You will get Free 50 MB Data instantly. 1.This offer only for idea customers. 2.Offer valid on visit the offer page from idea connection. 3.All users during this campaign will get 50MB Free Data for 7 days validity.